Andson has kicked off it’s Summer Reading Program at the YMCA! This wonderful program gets kids reading and eliminates learning loss during the summer. Often, low-performing readers are offered little opportunity to improve their reading skills outside the classroom once the school year has ended. Andson, in partnership with Vegas PBS, has brought Martha Speaks to the Y! Martha Speaks is an animated children’s television series that focuses on building vocabulary. Kids will watch and discuss each episode, then apply the words they learned, both orally, and in writing. Sonia Anderson, Andson’s CEO, was featured yesterday on Fox 5 More Show, live from the Durango YMCA. “To see a first grader tell you what “amazing”, “incredible,” and “stupendous” means is really amazing, incredible, and stupendous, and this is something Andson is able to bring to them,” she said. The Faces of the Future Breakfast is about highlighting the efforts of Andson in our community. On May 21st, we hosted our 3rd annual Faces of the Future Breakfast at the Southern Highlands Golf Club. Our speakers included Steve Schorr, Bart Patterson (President, Nevada State College), Kate Marshall (Nevada State Treasurer), Kim Wooden (CCSD Deputy Superintendent) and a word from Pat Skorkowsky, the CCSD Superintendent. Julie Tacker, an Andson tutor and CCSD teacher spoke about two young students who inspire her with every lesson. "Being a tutor and being able to teach in the same area, I'm able to talk with their teachers - find out their strengths, find out their weaknesses, find out different ways to get to each child, which is an advantage that I have as a tutor for Andson." She also said, "I get to see the growth academically, and in their confidence". Distributed on each place setting, was a hand written card by an Andson child, stating what they want to be when they grow up. "I want to be a doctor because I will help people if they are sick", read Steve Schorr. "Will this child have the opportunity to reach this goal?" Partners, leaders, and individuals are the reason that we can continue our mission to empower through education - that’s what this morning was all about. We are so fortunate to have such widespread support, from state policy makers, CCSD administrators, parents, and those who are in the trenches, the teachers who give so much of their time and commitment to this worthwhile cause. It's events like this that allow us to reflect and see from a different perspective, all the hard work put in by so many, and all of the rewards reaped. It is an honor when great speakers and attendees support Southern Nevada in such a big way. 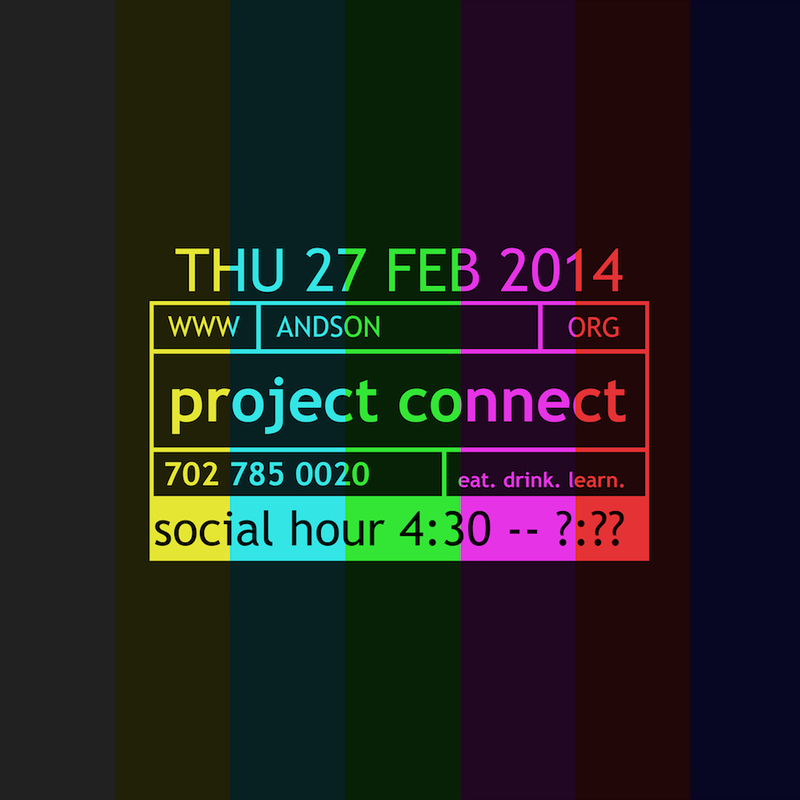 Project Connect Social Hour This Thursday! It's a informal way for Andson to connect with friends and supporters at our offices in Southern Highlands. We'd love for you to join us - RSVP here. Please contact us at 702-785-0020 or info@andson.org for any questions. We Don’t Compete, We Complement. That was the theme of Andson’s After Holiday Party this past Saturday, January 11th. Between board member’s schedules, staff’s holiday plans, and the high cost of trying to host an event before Christmas, we opted to move the event to January. What better way to kickoff the new year? Andson’s staff, volunteers, and partners mean so much to us - we have had amazing, solid growth because of each of them. This gathering shows the strong, interconnected bonds all of us within the organization have made over the last 3 years. We could not have asked for a more beautiful location and great food - Pacific Links’ Southern Highlands Golf Club hosted the event and will continue to support Andson’s busy event schedule for 2014. Andson’s team deserves a special venue, and Southern Highlands Golf Club does a fantastic job. B Sweet Candy Boutique from Summerlin provided a beautiful candy buffet - who knew this was going to be such a hit with our guests! Thanks so much B Sweet for providing an upscale twist on Swedish Fish, Gummy Bears and Cotton Candy. It was even Andson branded! In an age of digital cameras, there’s something nostalgic and awesome about Silly Shotz Photo Booth. Everyone enjoyed their photo strips at the end of the evening (we also have the digital versions of these, please contact us if you’d like copies emailed). Live music was provided by entertainer Betsy Holm and was the perfect background for the event. We don’t compete, We Complement goes much further than just the event, however. Through each program Andson facilitates, we strive not to duplicate efforts. We want to partner, collaborate, and grow for the youth here in Southern Nevada. We plan on great things for 2014 and appreciate all of our staff, volunteers, and partners. Thanks to all those in attendance! Galleria at Sunset chose Andson as the beneficiary of the "Leading With Style" fashion show presented on Saturday, September 21. Partnering with the International Academy of Design & Technology (IADT), Galleria Mall launched the fall fashion season with an event that not only showcased the latest trends from its retailers, but also featured community leaders as models. It was a fabulous evening, an original mix of gorgeous and courageous people - all coming together to have fun for a good cause. Local elected officials, youth and community leaders walked the runway and helped Andson raise funds for its community programs. Andson's board member Bryan Kroten strutted the catwalk and proudly received a $500 donation made by Galleria at Sunset. and many thanks to our own Bryan ...! Bryan Kroten is a community leader of the hospitality industry and an education advocate. Bryan serves on the Board of Directors of Andson providing guidance on its marketing and special events efforts. His expertise and leadership come from his position as Vice President of Marketing for Maverick Aviation Group and his involvement with the Las Vegas Hospitality Association, as their Chairman of the Board. This year, Bryan was selected as one of the "40 Under 40" best and brightest business professionals in Southern Nevada. Andson Academics has decided to launch a new initiative to teach children the basics of running a business while raising money for their own tutoring sites. Starting at the Boys and Girls Club of Southern Highlands, Andson will teach children how to setup a tea stand (entrepreneurship), create a budget and keep track of the money (accounting), and let people know about the idea (marketing). The first Kid's TEAching Stand will be debuted at the upcoming Back 2 Class Bash on Saturday, August 3rd from 5 to 7 pm at the Goett Family Park in Southern Highlands. Children will be selling tea themselves, and with the generous donation of tea from Raising Cane's, 100 percent of the proceeds will go to Andson's Homework Help & Tutoring program at the Boys & Girls Club of Southern Highlands. Second Annual Back 2 Class Bash! Presented in partnership with St. Rose Dominican Hospitals, Andson's Back 2 Class Bash celebrates Education while families enjoy an evening of music, arts, and entertainment. The event will also include giveaways, raffle drawings and community booths. Backpacks and school supplies will be given away on a first-come, first-served basis. Following the event at 8 pm, event participants and attendees will be invited to stay for a free movie at the park (Madagascar 3) sponsored by the Southern Highlands Community Association. As part of the Summer Reading Program, a group of children from Henderson and Boulder City will be attending the Andson's Back 2 Class Bash as a reward for their efforts and summer adventure! Another group of Andson students will be participating and leading the TEAching Stand initiative. Contact us TODAY if you would like to join the festivities and support our efforts. There are several different ways to participate and get involved - click here to download participation form! Andson attended two notable events this week. UNLV Community Partnership Orientation and Las Vegas Metro Chamber of Commerce luncheon - featuring Elaine Wynn. Both stressed the importance of highly educated citizens and the positive impact that it will have on the "health" of our society. We couldn't agree more – sustainable and inclusive economic growth requires heavy investment in human capital. We are happy to see that UNLV is taking the initiative to bring the community together and provide different venues of collaboration amongst local agencies. Navigating the nonprofit world and getting things done can be a daunting task if the act of "working together" doesn't get recognized and treasured. That's why it took us by surprise (very nice surprise!) when John Wagner, Director of Community Relations at UNLV, spoke about our Homework Help & Tutoring Program and highlighted our efforts to recruit more education majors who will work with us as tutor aides while getting paid through the Work-Study Federal Program. It is a proven model that we already have in place with Nevada State College and hope to see come to fruition with UNLV and CSN. Although Elaine Wynn may not be aware of the amount of resources that the Andson Organization is putting into closing the achievement gap, she did allude to our cause when she said that "there is a sense of urgency to break the cycle of poverty, and we know it can only be done through education." But it feels that our sense of urgency should shift to emergency when the Education Week's Chance-for-Success Index is telling us that "a child born in Nevada had the worst chance in the nation for growing up to be a success." What do we need to do? Elaine Wynn suggested a successful formula to turn our state around: community engagement, strong leadership, talented educators and adequate school funding. We agree with her that we are running out of time and that we all need to get involved by supporting literacy initiatives and advocating for education. "Community" is one of Andson's core values – we foster open communication, ongoing collaboration and continued partnerships with businesses, government agencies and nonprofit organizations. The kind of challenge that is in front of us cannot be accomplished without the driving force of those who get genuinely and actively involved. Where do you rank in community involvement? What started as a small effort has grown to huge proportions. It's difficult to think that we will reach nearly 2,000 students this year in Financial Literacy. Estimates for Homework Help and Tutoring are even higher. We started with an idea, a mission to change behaviors in regard to personal finance and education. This mission has helped us reach new partnerships, connect with new communities, and mentor new students. The creativity of our lessons has gotten us some recognition too - something we're quite proud of. And yet, we can't stop. We really are only as good as the lessons and services we provide. Enter Project Connect. For 2 years, this idea has been brewing. The idea is simple - Andson wants professionals from our community to give input to our programming. So, one Friday each month, we will be hosting Project Connect at our offices in Southern Highlands. Come by for some appetizers and drinks, and give us some input into the services we provide. Have a lesson idea for high schoolers? Any input on what we should do with Kindergartners after their homework packets are done? Please, share. Come be a part of our think tank on education and personal finance. We believe the way to extend our reach in the community, is well, our community. We continue to reach milestones on all fronts! Andson has attended the Governor's Black Tie for the past 3 years. It has always been an amazing event - but this year was something special. This year, Andson was one of 8 beneficiaries selected by the Southern Highlands Charitable Foundation! We were absolutely thrilled about this opportunity. The recognition as a leader on the forefront of educational activities in Southern Nevada means so much to us. We want to impact as many students as possible, and this fuels our programs in such a meaningful way. It was an inspirational moment to have Train performing while one of our videos played about the work we do. It doesn't get much better than when the team gets to be on the big screen! This year we added two new locations to our Homework Help & Tutoring Program, and the program itself went from 180 to 800 students. In addition to the 5-lesson course at Walter Bracken Elementary School, we have now expanded to include workshops at Chaparral High School, Desert Oasis High School and Nevada State College! We have also been favored by the increased recognition and support of the community; not only in the number of friends and volunteers that genuinely believe in our mission, but in the vote of confidence that generous donors and local philanthropists are putting into our work. The Governor's Black-Tie Invitational marked a very special milestone for us and it is a perfect example of what a community can accomplish. Over $14 million dollars has been distributed to organizations in our community as a result of this tremendous effort. And, did we mention Train performed on Friday Night! A special thank you to all those in attendance. Thank you to all those in support of what we do! One of the many challenges facing the Clark County School District is helping English Language Learners (ELL) - about 53,000 students who themselves and/or their parents do not speak English as a first language. Clark County has the nation's third-highest population of ELL students as a percentage of total enrollment. After the appointment of Ms. Lucy Keaton as first assistant superintendent of CCSD’s English Language Learner program just over a month ago, and as the issue came up again at the CCSD Parent and Community Forum, we must ask ourselves what would happen if we are able to turn this weakness into a real and competitive advantage – it could go beyond lower dropout rates! Hoping that most of these students would want to preserve their parents' native language, they will not only have a higher chance to graduate from high school, but they would also be fluent in both languages. The advantage does not stop at being bilingual with no accent, apparently there are other cognitive benefits that would have positive effects on children's development. On Tuesday, February 26th, the Andson and the Boys & Girls Clubs of Henderson hosted the 2013 Faces of the Future Breakfast that benefited educational programs at all the clubhouses across the Valley. The breakfast not only gave local community professionals the opportunity to meet and mingle, but also provided a glimpse into the work being done to equip children and young adults with the skills and knowledge they need to thrive. Thank you to everyone who took time out of their busy schedules to attend the 2013 Faces of the Future Breakfast, as well as those who decided to generously made a gift in support of our efforts. It has been an incredible year for the Andson Organization, and we were happy to celebrate education with over 200 guests in attendance. The breakfast aimed to raise funds for our Homework Help & Tutoring Program, which has grown to nearly 700 students per day throughout the Valley, also increased community awareness of our organization and forged new relationships with key community partners. We are also grateful to our guest speakers, sponsors, community leaders, and each of our table captains for their dedication and partnership. Without their valuable contribution, it would not have been possible to have had such a successful event - please join us in thanking them! We advocate the importance of homework in the process of improving academic achievement. Arguments, in favor of homework, fall into one of three categories: practice, preparation, or extension. Practice helps students retain the knowledge being taught during the class. As in real life, people need practice in order to get better at the things they do for a living, Just think about football players, musicians, actors, surgeons etc. The learning skills and study habits gained through homework prepare students for higher education and the challenges of knowledge-based society - with knowledge comes innovation and innovation is the key to survive in today’s world. Homework is an extension of the classroom experience that introduces children to the "adult" world of priorities, time management, and deadlines. Homework can also be an extension of learning at home, which allows parents to be involved. That is precisely one argument against homework. The disparity between students from a middle-class background (study space, computer, internet access and parents who have the time and skills to help) and those students from disadvantaged backgrounds who simply don’t have the support and resources they need to complete their homework. Anti-homework advocates, such as French President Francois Hollande, insist rich kids benefit more from homework than poor kids do – that might be true, even more when the gap becomes bigger as disadvantaged students start falling behind. But getting rid of homework is not going to solve the problem. A solution would be to lengthen the school day, but in times of budget cuts and overcrowded classrooms, after-school programs are providing the time for children to complete their homework once the school day is over. We, at the Andson Organization, are committed to helping students reach their full potential regardless of economic background, and we are doing it through our Homework Help & Tutoring program. Homework comes before playtime, so we are teaching kids that responsibilities come first. Love of learning and perseverance are values we hope to instill in hundreds of students across the Valley. Want to know how we are doing this? Come join us for our Faces of the Future Breakfast on Tuesday, February 26 at 8 am at the Boys & Girls Club in Southern Highlands. A very different group takes over the Strip - NV DECA. On Monday, February 11, I went to judge the Nevada DECA Competition at the Flamingo Hotel and Casino. Not knowing much about DECA, I had no idea that this day would mean as much to me as it did to the students. DECA is an organization that is co-curricular - meaning they are in the classrooms (like us). Did I mention these were High School students? Some were only Sophomores! The day was amazing. These students had 10 minutes to prep their case, and come present it to one of the hundreds of judges that volunteered that day to facilitate the competition. These were mock situations, of course, but the energy and enthusiasm was overwhelming. Many thanks to Nevada DECA for doing the amazing work of preparing young people for the adult/business world. It inspires me to keep Andson innovative, and not to forget our mission: empowering through education. Remember, if education is about fun and opportunities, STUDENTS PARTICIPATE!